Your garage is a focal point of your home, so it is important that your garage door looks good and functions safely and properly. At Sears Garage Services we provide new garage door installations, replacements, repairs, as well as several garage door openers to make the operation of your garage door simple and convenient. Give us a call at (866) 362-9192. Installing a new garage door can feel like a big project and with the help from Sears, we'll make it easy on you. Home-owners need to choose a style that works with your home, a level of insulation for your door, and decide on whether or not you want a smart-phone enabled garage door opener. The technicians at Sears Garage Solutions are here to give you the direction you need to get the installation that is best for your home. We offer some of the best warranties along with several special financing offers, don't forget to ask us about them! If your current garage door is old, out-of-style, worn out, or not working efficiently, Sears garage door technicians can help you replace it by helping you select, order and install it. If you discover that your garage door has broken springs, or is not setting right on its hinges, cables, or rollers, that door may be unsafe for you and your family. At Sears Garage Services, we can assess your situation and often repair your garage door for several more years of use. We even take emergency calls for those times when you need those repairs right away. An automatic garage door opener makes the operation of your garage door that much easier. Whether you are taking this step for the first time, or upgrading your opener for one with more advanced features, Sears is here to install the opener that's right for you. Come join your local Sears Sacramento Garage Doors crew at some of these exciting local events. It's never too late to be a part of the Sacramento community. Come see why Sears Sacramento offers a wide variety of high quality garage door styles. A new garage door can be a costly investment but one of the best investments you can make. 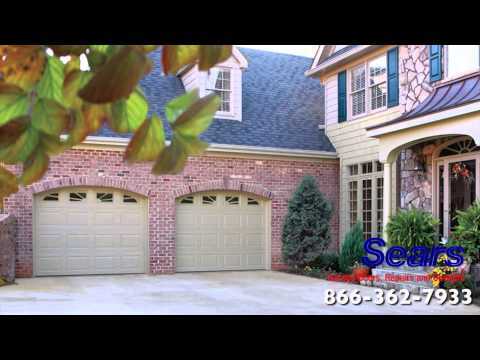 A Sears garage door will not only improve the look of your home but your home value as well. All of our garage doors are made in the USA and pre-painted with 6 coats of paint including a rust preventative, primer, and top coat. Choose from a variety of colors and styles and find the best garage door for your home. I'm checking on financing and will get back to you to start the job as soon as possible. I told the customer service person I wanted to be the last person of the day. That was not done. I was also told I would be notified the day before the technician arrived. That was not done. All of this is because my mother is on Hospice. Well the technician arrived, probably the 1st on the list and thankfully I was still at home. And luckily he had been to my home to adjust my garage door previously. Customer Service needs more training. Don't promise what you can't deliver. Cody was great at providing me with details of what he did and ensuring that it was to my expectations. He also did a great job of explaining his recommendation for additional service. I appreciated being kept up to date on his arrival schedule. Technician was on time, friendly, knowledgeable and provided a great service. The garage door runs much better than I ever thought it could. Thank you! knowledgeable, courteous, and prompt. One of your most professional. Jose Morales clearly explained how to maintain my garage door by performing quarterly lubrications of the hinges & other moving parts. THANKS! Cody did a wonderful job; he is professional and respectful. Thank you. Great service, technician was on time and very knowledgeable. Price and service was reasonable and he left my door better than it was.